The spring anime season has now officially ended for me, so in the interval before the summer shows begin it's time for a quick look back at the last three months of my anime streaming adventures. A bunch of titles appeared as late additions to this season's list of legal streams long after I made my 'first impressions' post, so I've added my first (and last) impressions of them in this segment. I didn't bother with the shows which suddenly appeared on Animax in June since it was hard to watch them from the beginning without paying for a subscription to Animax's notoriously unreliable service. Still, if they keep on licensing so many titles I might end up having to subscribe next month. Speaking of the various streaming services, Crunchyroll was the only anime simulcast site I used this season. Wakanim had absolutely no new content, Daisuki didn't fare much better and the aforementioned Animax has yet to convince me they know how to run a service worth paying for. Several titles this season were very enjoyable; depending on my mood JoJo's Bizarre Adventure: Stardust Crusaders and Haikyuu!! would easily have had a shot at the top three. The quality of the best shows made the two that I didn't like that much - Dai-Shogun Great Revolution and Captain Earth - seem weaker than they would have done otherwise. 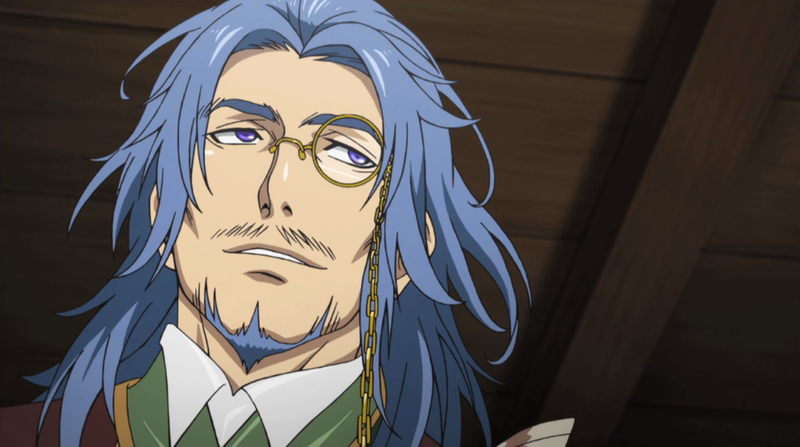 I can't really explain why I chose KamiAso for my favourite. It was the one I looked forward to most every week even though it was usually pretty fluffy. The episode where the guys all dressed up (mostly in drag) to perform a play was easily the most entertaining episode of anime I've seen in a long time. Captain Earth is continuing into the summer season but it's time for me to call it a day. I gave it a dozen episodes and still wasn't feeling anything special from the story, however well-produced and charming it was. There's not going to be enough space in my schedule to continue to wait for something more interesting to develop. Love the designs. Shame about the show. Like the first title in the list, Dai-Shogun was a big flop. I wanted to like it so much! Raunchy humour, a roster referencing famous names from Japanese history and giant robots - there was so much potential. And yet it was easily the most tedious show that I watched this season. If it had been aired on a busier day (like Saturday) I would have given up and dropped it rather than pressing on and hoping that things would improve. Dai-Shogun wasn't ever really bad, it was simply pointless. The problem with the show's content being weak was magnified by the worst animation quality I've seen in a long time. The actual artwork was fine, but rather than animating it in the usual way the staff used digital effects like zooming, distortion and wobbling the camera instead. It looked terrible and really cheap. Nothing kills a sleazy fanservice title faster than horrible visuals. I knew nothing about volleyball at the start of the season. While it would be an exaggeration to say that Haikyuu!! has turned me into a fan, I feel as though I can appreciate the sport's appeal much better now thanks to its patient explanations of the mechanics. What began as a normal shounen series about two polar opposites coming together on their school volleyball team has now blossomed into a story about hard work and team spirit. The characters all have so much heart that it's impossible not to get swept up in their enthusiasm. I still cannot believe this was actually licensed for a home video release in the west. 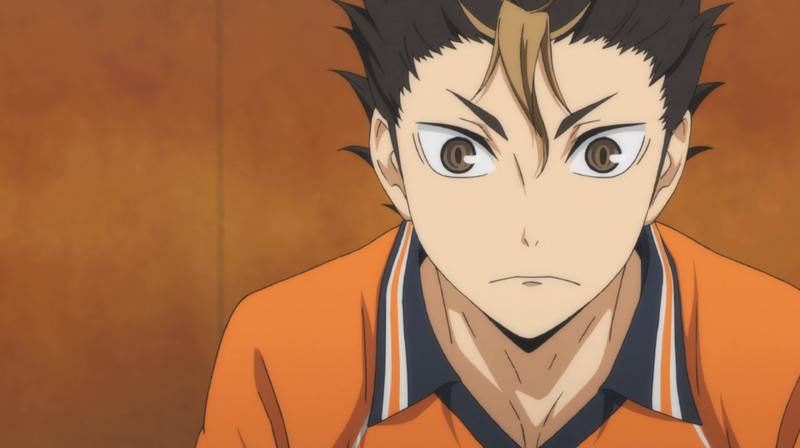 I'm definitely going to find time to keep watching Haikyuu!! when it continues into the summer season! 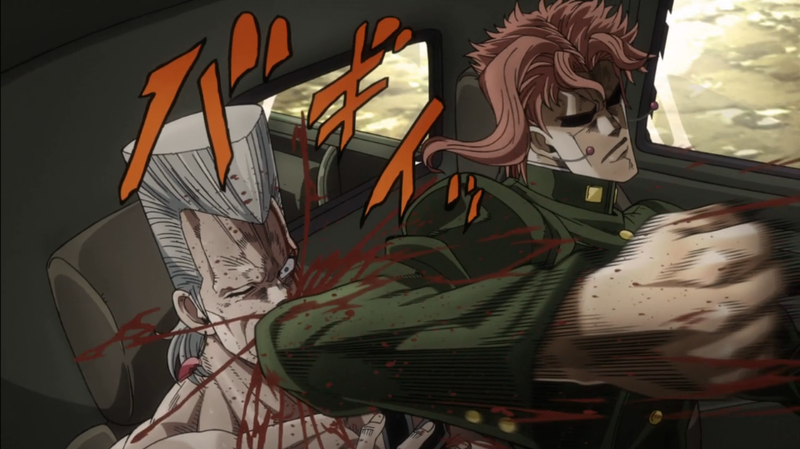 It's been a little late in coming but 2014 is turning out to be the Year of JoJo in the west, with a revival of the English adaptation of the manga, a rumoured US home video release for the recent television series, a localisation for the PS3 game and, of course, Crunchyroll's simulcast of Stardust Crusaders. The news that Stardust Crusaders is going to run for a full year has been the icing on the cake; the ongoing JoJo's Bizarre Adventure anime project seems to be a huge success. If there's anything to criticise about the new show it's that I'm still not finding the leads as memorable as those in Battle Tendency. Joutarou is likeable yet at this point in the series he's still overshadowed by Joseph, and people come and go so quickly that it's difficult to get attached to any of the supporting cast members. Kakyouin has been responsible for the most outrageous moments so far. I love his voice. With this first batch of episodes out of the way it's clear that there's a long way to go until the conclusion - the antagonist has barely appeared at all. I'll keep watching until the very end. KamiAso was amazing! The storyline is a typical otome game setup with a likeable young lady suddenly surrounded by a group of gorgeous guys - guys who all happen to be deities. The show knows that it's ridiculous and doesn't bother trying to hide it, filling each episode with self-aware humour and references to real legends about the gods. 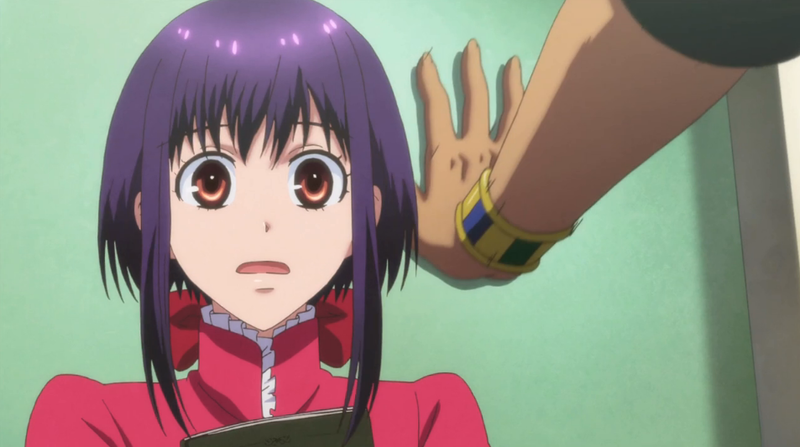 There's a fun gag where the serious Thoth pins Yui against a wall at an unexpected moment in every single episode, and another where the staff hide a cameo from Anubis somewhere for the viewers to try to spot. Fans sometimes spent more time hunting for these in-jokes as they did wondering about which of the guys would be the best match for the heroine. The atmosphere reminded me of a slightly more serious Uta No Prince-sama (that's a compliment) and when the plot became darker from time to time there were some surprisingly good action sequences. All six of the main characters were developed acceptably and the side characters like Dionysus, Thor, Thoth and Anubis appeared in every single episode too. 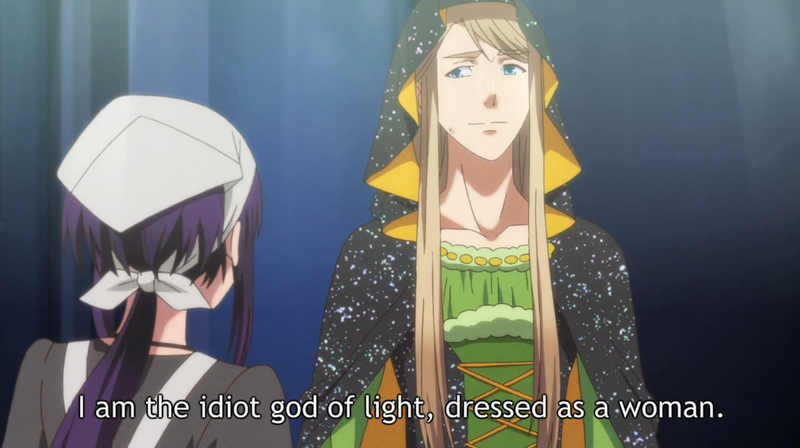 I can't fault it; Kamigami No Asobi is an all-round fun show and a shining example of how to adapt an otome game into an anime series with broad appeal. I can't wait to pick up the Blu-ray collection from Sentai Filmworks in a few months' time. It feels unfair to rate Mushi-shi alongside silly titles about royal weddings and handsome gods on winged horses because it provides a completely different experience. Each episode follows the same pattern yet I don't think I'll ever get tired of hearing these tales of rural communities being affected by the mysterious world around them. It never gets boring; the show is as much about human nature as it is about the ethereal mushi which drive the plot forwards. I can't wait for the soft-spoken Ginko to guide me back to the world of mushi when Mushi-shi resumes in the autumn (or slightly earlier - the confusing scheduling means that there will be a couple of extra episodes over the summer). After the halfway point the main storyline seemed to drift. Most of the supporting characters completely overshadowed the leads to the point where I stopped caring about the plot at times in favour of worrying about people like Hideyoshi, Caesar and Himiko instead. I'm not convinced that this will be remembered as one of the best written shows ever made but it was at least entertaining right the way through, looking and sounding gorgeous from start to finish. I loved SoreSeka far more than I'd expected. It's a generic shoujo-style romance between a self-assured princess who can summon the rain, and an accomplished - if emotionally scarred - young ruler. The series slowly develops their romance as the pair work through their cultural differences and mature as human beings. 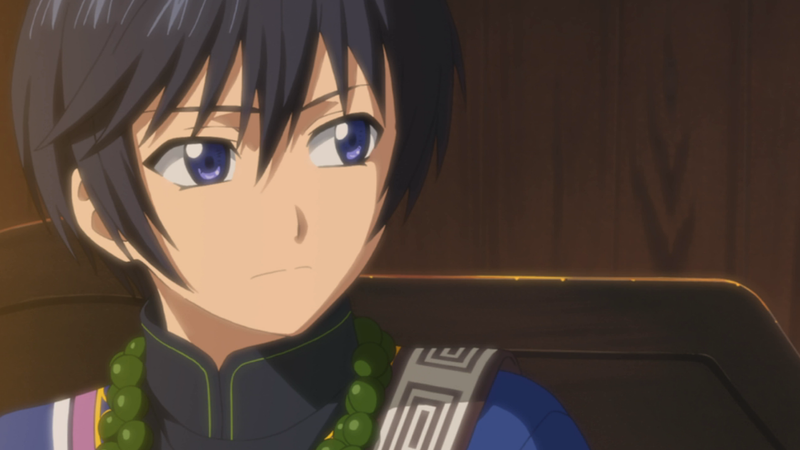 SoreSeka remained a harmless, chaste love story from start to finish and for some reason it really hooked me! It was impossible not to root for the two leads as they faced an endless stream of challenges and grew stronger together. It sounds silly to drop a title with such short episodes to save time. I just wasn't that interested in it after the first heroine's arc finished and while there was nothing wrong with it I decided I'd rather put those precious minutes to better use elsewhere. With Daisuki's stream of M3 the dark metal I've been blessed this season - for the first time every single title I wanted to try is legally available to the UK! A group of eight rather annoying students are thrown together for a dangerous mission. This setup provides mecha, monsters and mysteries in abundance, but because the main cast is so irritating it's harder than I expected to stay interested in the plot. The dark palette didn't look so great on Daisuki's player, so I opted to skip the rest of the series until it receives a Blu-ray release in the US. If it doesn't, then it's no big deal. A charming sitcom about the eccentric people who work on a late night television news show. It's a fun little comedy even with the floaty animation and designs. This kind of show is the real strength of Crunchyroll and I applaud them for continuing to acquire titles which probably won't ever see a western home video release. How does Japan keep producing such crazy shorts? Even with all of the last-minute additions there were still a number of shows with no legal UK stream whatsoever. The final list of titles with their official English-language streams blocked from the UK is PUCHIM@S 2, Broken Blade TV EDITION, Majin Bone, One Week Friends (Isshuukan Friends) and The Irregular At Magic High School (Mahouka Koukou No Rettousei). Sidonia No Kishi (Knights Of Sidonia) is coming west in the summer season instead to accommodate a dub release on Netflix. I'll be too busy to watch it then so it's just as though it was never licensed in the first place. That's all for this season. I only stuck with a handful of shows right the way up to the end. All in all, the spring season was relatively quiet with a few sparkling gems amongst the more forgettable titles. In contrast, the upcoming summer season is looking merciless! It's going to be a real challenge to keep up with so many different shows. Re: Nobunaga the Fool, I also enjoyed it a lot, but it was an uneven show indeed. Fortunately, Hideyoshi, Caesar and Himiko kept my interest grounded - especially Caesar, he was such a delightful character, with Nakamura Yuuichi bringing his prettiest ikemen voice to the role. I usually find that I make up my mind about a character very quickly and stick to it but Caesar was a strange case of my feelings completely changing from hate to love within a couple of episodes. What an interesting, likeable guy he was! 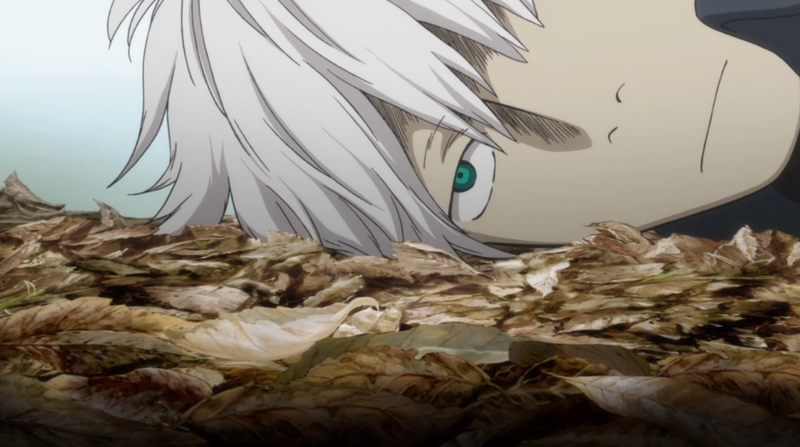 Do you know what's going on with Mushi-shi this season(s)? The schedule is so uneven. Well as long there will be more it will be worth the wait. 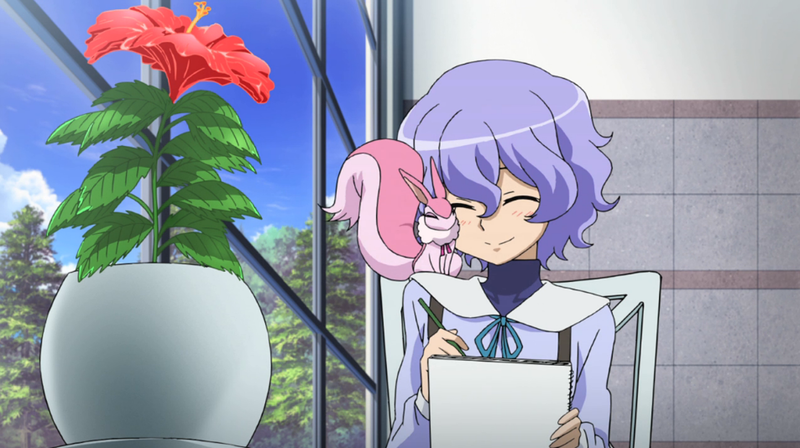 I really liked the latest ep where it was just Ginko and nature/Mushi for once. I guess we're getting compensated for the gaps in August according to reports so that will be a nice bonus dose of Ginko before he returns in the autumn. I think I need another month to let the previous episodes sink in properly; for such a simple-looking series the stories really make me think sometimes. 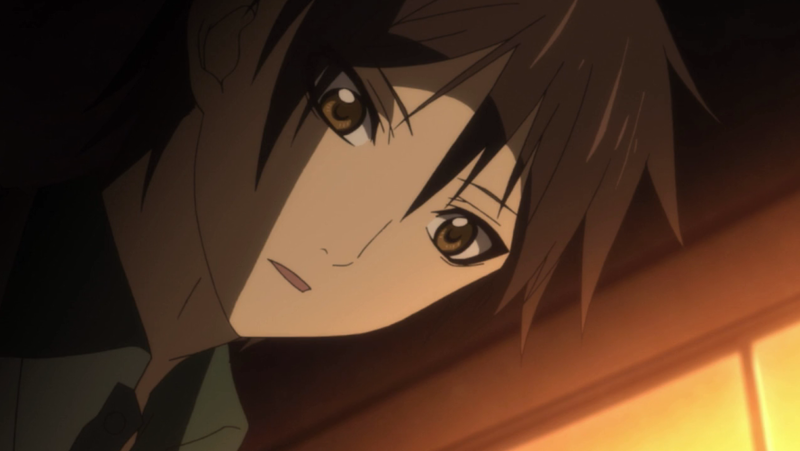 I got a little worried about him too, even though he is the main character and I know he will survive! The series can fool the viewer into thinking it's simple and easy-going with it's oddly calm pace but it's often scary (God the episode in season one with the Mushi children...!) and often about difficult things like loss and the human mind. So yeah, it's not something to marathon anyway. 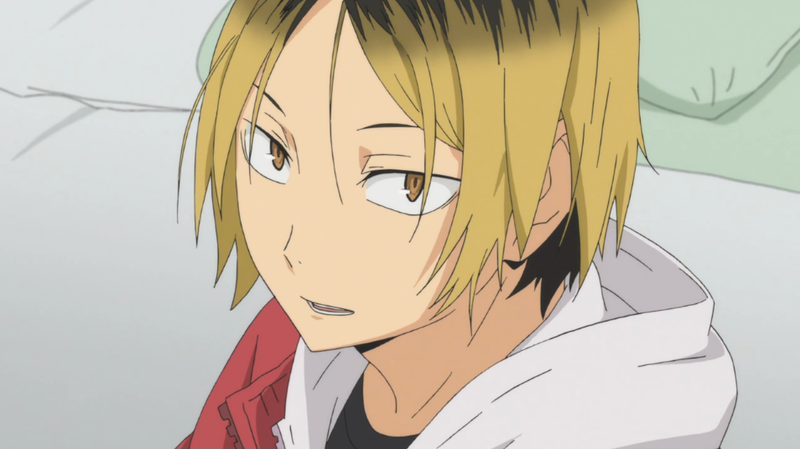 But I'm glad that there will be more eps it was so abrupt when it ended on episode 10.